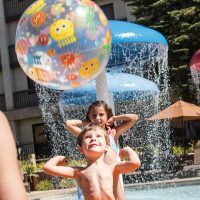 This hotel is for the families! 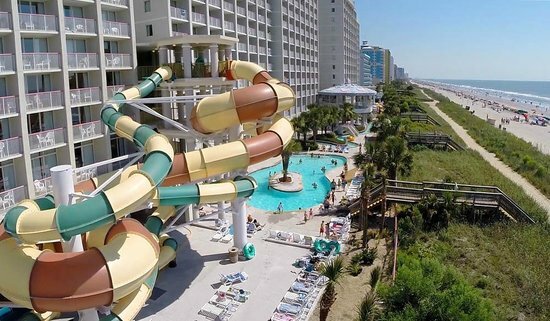 The Crown Reef Waterpark towers nearly 40 feet above the ground and features a 278-foot long two-person tube waterslide; a single-person 302-foot long waterslide; and an 8-foot tall, 20-foot long slide for the little ones! There is much activity for all ages at the park. When it comes to room choices, there is everything from standard to entire houses for rent. 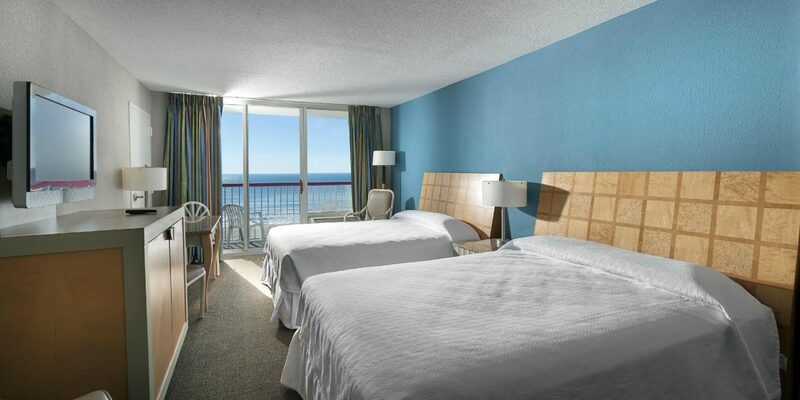 Perfect for families is the three-bedroom oceanfront condo that features one king bed in the master bedroom, two queen beds in the second bedroom and two double beds in the third bedroom. Additional sleeping space is available in the living room, which features two double sleeper sofas. The master bedroom, second bedroom and living room all feature large sliding glass doors, which allow access to the giant oceanfront balcony. 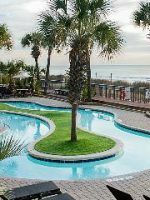 The living room features ample seating, spectacular oceanfront views of northern and southern Myrtle Beach, a fireplace, a large flat-screen TV and PS3 Gaming Console. 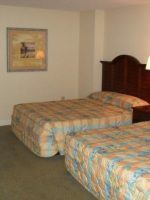 Each additional bedroom also features their own flat-screen TV. 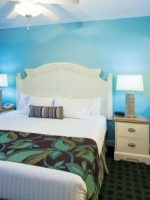 The expansive, fully equipped kitchen is furnished with a dishwasher, large refrigerator with icemaker, Keurig coffeemaker, four-burner stovetop, double oven, microwave and basic cooking and eating utensils. This unique condo also features your very own laundry room equipped with a washer and dryer, spacious closets and richly designed bathrooms, including an oversized jetted bath tub in the master suite. 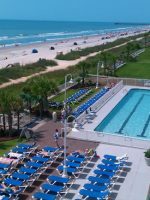 The condo is located on the top floor of Tower 1 and can sleep a maximum of 14 guests. Never go there.. rooms were disgusting.. beds were horrible... The only thing nice was the view and that's because they don't own the ocean.... They really need to renovate and get new staff and new cooks. 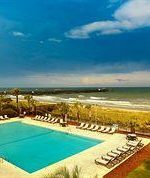 We came to Myrtle Beach on 19th April at 4:00 pm to check in. Where you end up parking your vehicle check in is across the street totally confusing..I am not sure why they don't have it at the property. It took 2 hours to check-in..systems were down and a long queue. After driving for 4 hours I had to stand for 2 hours. Once we got the room supposedly I had booked a suite which I thought should be good and the room was a nightmare. Torn bedsheets, room as smelling and it seemed like no one has renovated the place in years. Filth was lying near elevators. My both kids developed allergies as soon as they were get ready for a nap.It took me 2 hours to check in and 30 minutes to check out from the space. I have always stayed in Marriott properties in the past and fortunate enough to get to Vacation club.